Indian music being extempore in nature, has taught Kala Ramesh to think within and without the box — to be creative, daring and innovative and still adhere to the demands of an art form. Kala is keen to see children and adults in India take to haiku and its genres. 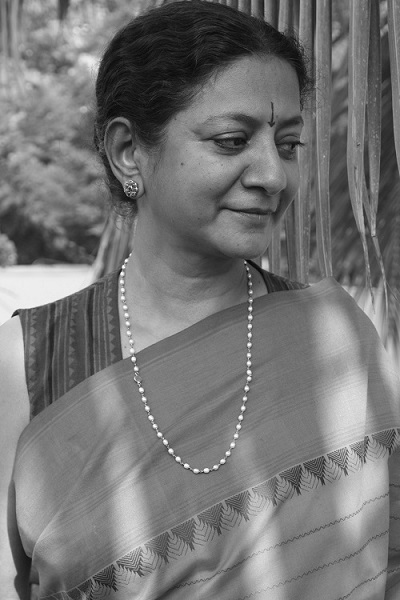 In the last two years, she has conducted nearly 50 workshops and has had 90 hours of teaching haiku, senryu, haibun, tanka and renku to the under graduate students at Symbiosis School of Liberal Arts, Pune. Ramesh Anand: What are the different types of short poems you write? Kala Ramesh: I started with haiku and in a week’s time began to write tanka, haibun, senryu, one-line haiku and even tried zip haiku. In November 2005 Norman Darlington introduced me to renku and we composed a Triparshva in India’s six seasons, which was published in Simply Haiku in summer issue 2006, Vol4:No2. After that I’ve taken part in many renku led by John Carley. John Carley was a pleasure to have as a sabaki [lead poet]. He knew so much about renku and the link and shift that is employed in renku. All these works are published in reputed journals. RA: Why did you choose Japanese short forms over several other forms of poetry as your specialness? KR: Sheer accident. My passion, from the time I can remember, was to become an Indian classical musician. I come from a family of writers – my mother is a Tamil poet, my siblings - two sisters and one brother, are all such good writers that I totally kept away from any sort of writing. My father, age 93, is still a practicing doctor and has written his life story with the help of my brother. As late as October 2004, I began to write short articles and essays on Indian music. Before that, all I remember writing were school leave notes and debates for my two children. Nothing more! My brother did mention the existence of a type of poetry called ‘haiku’ as early as 1998, when we were seriously discussing Hindu philosophy, but that passed me by like an autumn breeze. I again came upon haiku accidentally through an Indian poetry online site – boloji.com - on 14th of January 2005. Down loaded their five lessons on haiku and started to write. Since I was then into serious classical music [as a vocalist], I tried writing haiku, all based on music without any connection to nature. Blissfully unaware of haiku's subtle nuances, I began to submit my work within a week. Every rejection made me look at my work through the editor’s eyes, and I think that helped a lot. RA: Briefly tell us about your entry into global publications in short forms? in wonder . . . He said that if I could give him four more tanka as “strong” as this, then he would make a set for me in Simply Haiku. I was stupefied! This, according to me was my weakest, the rest of the tanka in my submission were ‘bejewelled’ with heavy words and complicated thoughts . . . In the end, nine of my tanka were chosen for the summer issue of Simply Haiku 05. A beginner’s luck, as they call it! And then Stanford M. Forrester of Bottle Rockets published my first haiku in Fall 05, in the autumn issue of Simply Haiku, Robert Wilson showcased my work in “Haiku and Indian Music” and in Spring 06, I won The Heron’s Nest Award . The Mainichi Daily News picked up several of my haiku, and my tanka began to be accepted by Ribbons, Modern English Tanka, and other journals. Contemporary Haibun online and Simply Haiku published my haibun. Alan Pizarelli encouraged my writing and picked many of my senryu for Simply Haiku, around that time. RA: Who were the prominent Indian short forms poets during your entry into global publications? RA: Who are the prominent short forms poets in India today? KR: Haiku in India is blooming. I think she’s soon going to be a force to reckon with in the world haiku scenario, for sure. There are too many brilliant haiku poets now for me to enumerate and I wish you all great success and joy on the haiku path. Even the youngsters are doing very well now. Special mention has to be made about the students who took the 2 day intensive haiku course at the Katha Utsav on 28 & 29th of December at Delhi, 2013, an initiative of Katha and CBSE to get children into creative writing. Some of the participant’s haiku have been published by the well known haiku poet, an’ya in Cattails – a haiku and tanka journal. RA: Please share with us the honours you have won in short form poetry along with the honoured poems. KR: I used to enter contests the first two years, and then stopped it completely. It was too cumbersome to take a print out of our poems, then send them abroad with the money etc. I now enter contests only if they are free and they allow email submissions. Devi temple . . .
that mount the horizon up . . . ? The Heron’s Nest - Volume IX, Number 4: December, 2007.
the year passes . . .
liquid sky . . .
Notes from the Gean - Issue #4, , March 2010.
wild violets . . . Winner: The Snapshot Press eChapbook Award 2012 (UK) for the collection of her tanka poems “the unseen arc”. It should be go online by spring 2014. Our Rengay [Tracy Koretsky, Garry Gay and Kala Ramesh] "The Last Word" won the first place, along with the prize money of $100 in the 2011 HPNC Rengay Contest, USA. RA: Tell us about your experience in teaching haiku for children in India. KR: Absolutely wonderful! At present I’m thoroughly enjoying the experience. Children take to haiku like fish takes to water. I’m sometime stupefied, amazed at the quality of their haiku, that for days on end I don’t ever attempt to write any haiku, for whatever I write doesn’t seem even half as fresh as theirs!